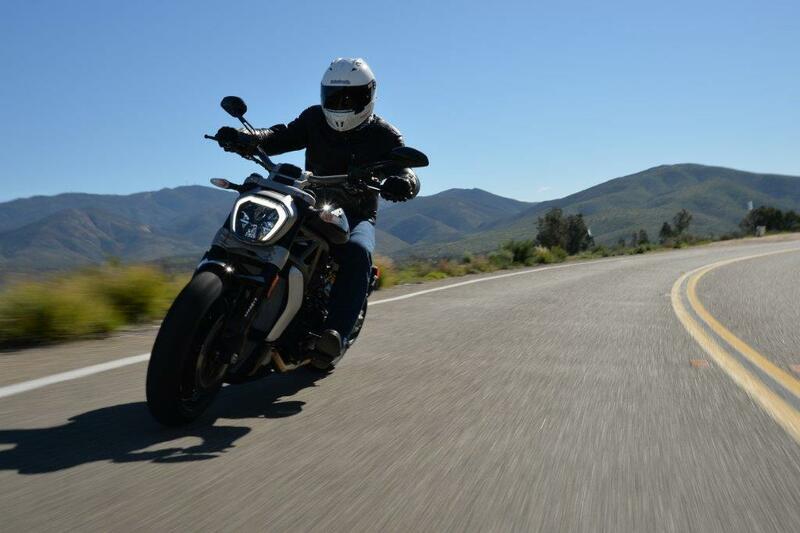 Ducati have redefined the cruiser market with the all-new XDiavel which offers feet-forward riding fans an altogether different experience from traditional rivals. 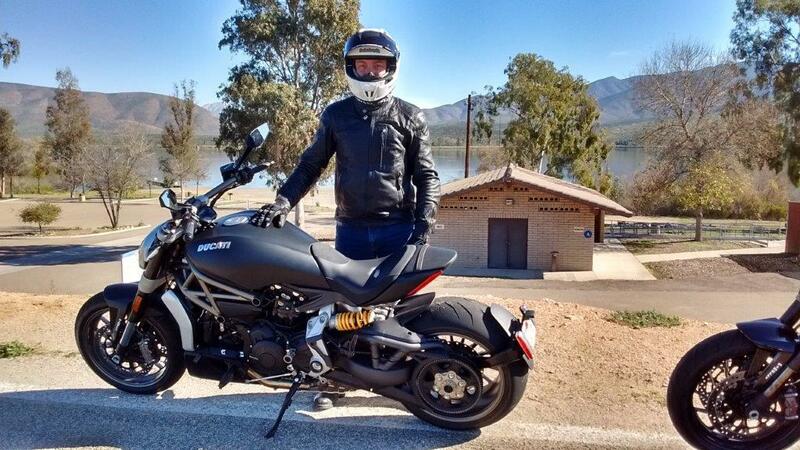 MCN’s Senior Reporter Andy Downes has just got off the bike as one of the first journalists in the world to get to test the bike in the area around San Diego in California. The location is no accident. 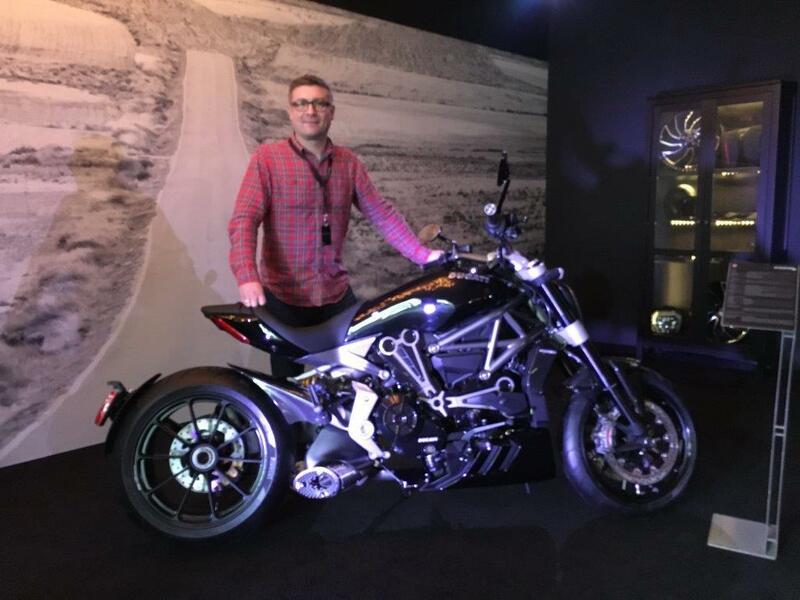 The American cruiser market is simply huge and Ducati wants to fight for a larger slice of it so the firm wants to show the bike off where it hopes it can take big sales. As usual for Ducati there are two models; a standard XDiavel and the higher specification XDiavel S. MCN got to test both models; although the actual mechanical differences between the two bikes are newer Brembo M50 front brake calipers and a black coating on the fork legs and a different LED daytime running light on the S model. The rest are cosmetic changes. Long, low and all black in colour the XDiavel is a menacing sight in the metal; only one colour option is available on each bike. Matte black on the standard bike and glossy black on the S. On the move that length just never becomes an issue. It still handles, goes and stops like a real Ducati and the new 1262cc version of the Testastretta V-twin has thumping torque to make riding on the road easy. The engine has the Desmodromic Valve Timing (DVT) system first seen on the Multistrada 1200 DVT last year. The hydraulic variable valve timing system has been designed to take the lumpiness and piston slap out of the motor, smooth off the revs low down and make low speed riding more comfortable. While the hardware of the DVT system remains the same, the way it has been programmed to work has been retuned for the XDiavel. The XDiavel is almost a completely new bike from the ground up despite the styling similarities to the existing Diavel range. It basically shares the same Pirelli Diablo Rosso II tyres, the clutch, gearbox and generator. 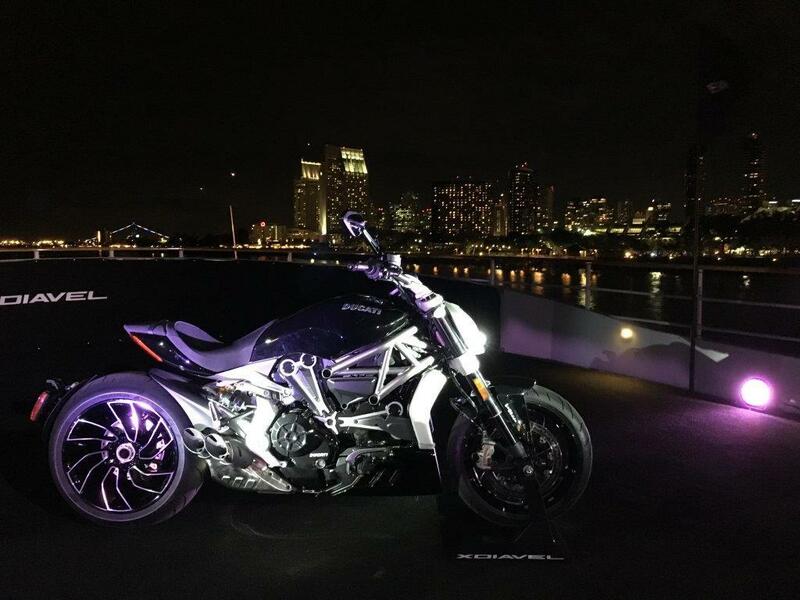 Everything else is new and built specifically for the XDiavel and that includes Ducati’s first ever belt-drive system which needed carbon-fibre weave to make it strong enough to handle the power and torque from the engine. The 1262cc, 153bhp V-twin installed in the XDiavel is essentially a new engine when compared directly to the Diavel or Multistrada 1200 DVT. The 1262 DVT motor produces peak power of 153bhp at a lowly 5000rpm. The torque peaks at 95ftlb but it produces 72ftlb at just 2000rpm! Combined with the new motor is a full complement of electronic control systems including cornering ABS, traction control, anti-wheelie, three riding modes, cruise control and Ducati Power Launch which is a three-mode launch control system. It all seems a very long way from the simplicity of a Harley-Davidson cruiser for sure. 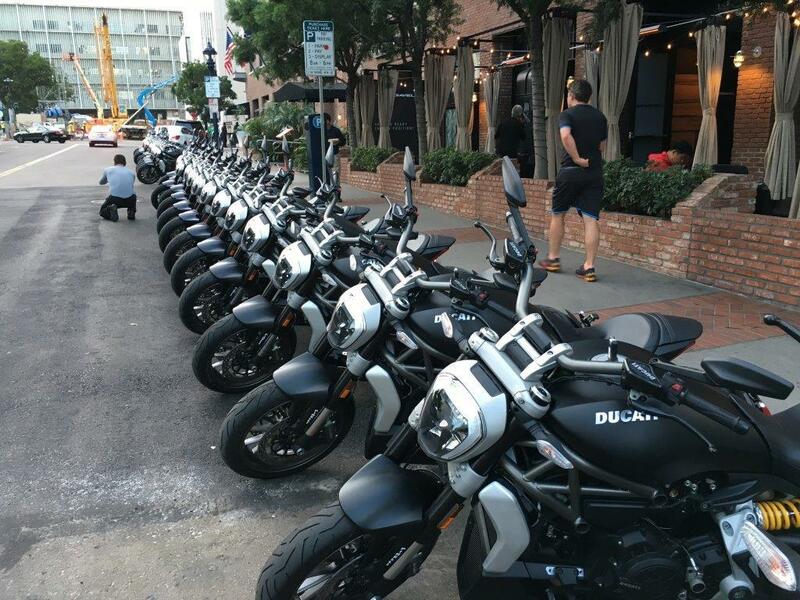 The Diavel will continue to be on sale alongside the XDiavel for those Ducati riders who don’t want a feet-forward riding style but want the muscle-cruiser looks. 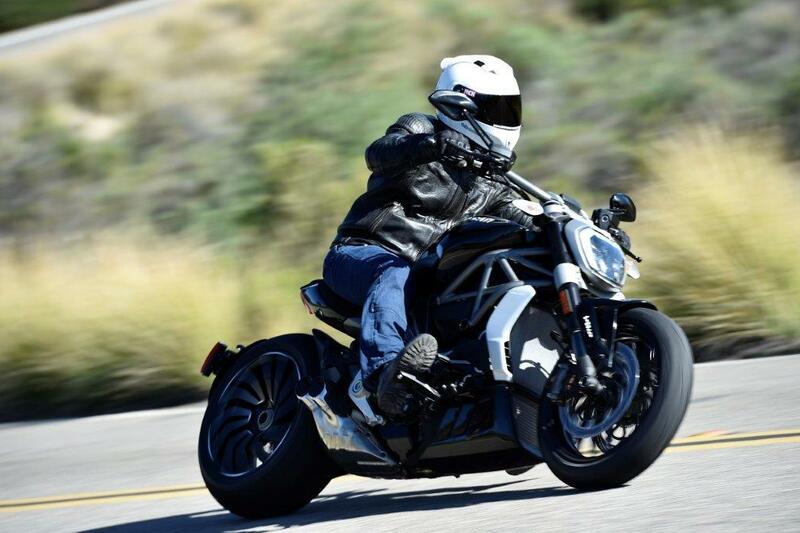 Ducati bosses have admitted there wouldn’t be an XDiavel if it wasn’t for the Diavel paving the way, smoothing the waters and getting the world ready for a Ducati so far from the normal range. 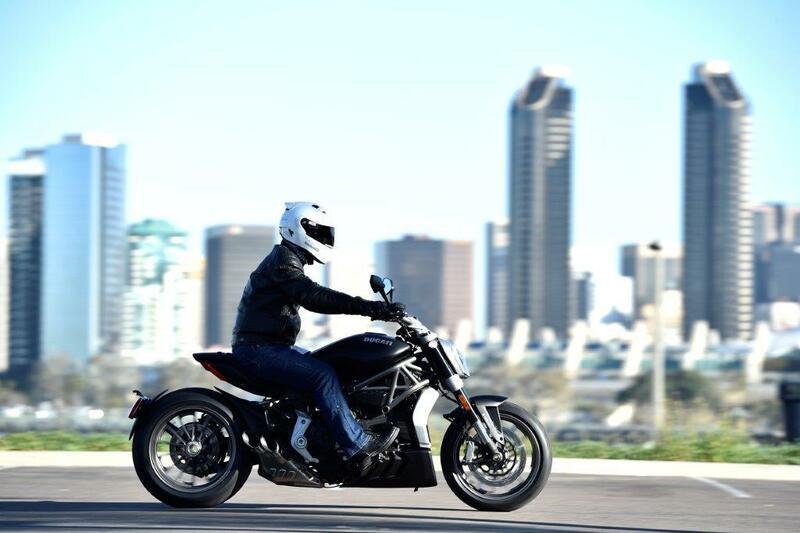 Traffic-clogged San Diego was a slightly dull but very illustrative way of getting a feel for the XDiavel. I initially started in Touring mode which is the softer of the two full-power modes. Sport is the same power and torque but a sharper throttle response. After a couple of miles I switched to Urban mode which drops the power to 100bhp and softens off the throttle response and makes the bike far more of an easy-going cruiser through heavy traffic. 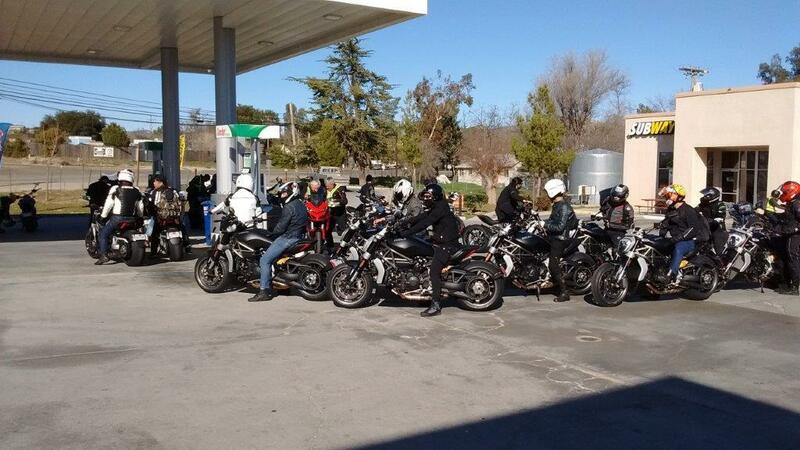 Out onto some amazing roads running through the hills in the direction of Mexico and the XDiavel was able to deliver the sorts of riding thrills no other cruiser could have got anywhere near. Power wheelies in first, second and occasionally third were reigned in electronically by the bike but were ample demonstration of the torque on offer from the engine. I was initially a little hesitant in pushing on any harder because I wrongly assumed the long wheelbase and raked out front wheel was going to make the bike unwieldy and hard to steer. But in reality it’s nothing of the kind and you can still push hard on that front Pirelli tyre and have direct knowledge of what’s going on. Combined with the shove from the engine, the ferocious braking power from those Brembo M50 calipers on the S model and the decent 40 degree lean angle on offer, this is a cruiser that can still deliver great handling with all the cool you could ask for. In some ways I think this bike is going to be far too much of a performance bike for some in the cruiser market. 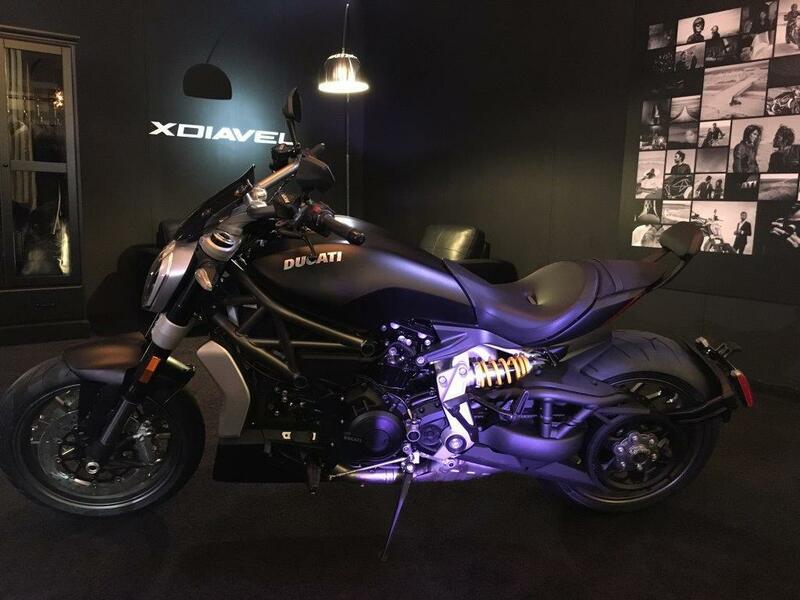 It’s very, very fast and quite firmly sprung but if you have always wanted the looks of a cruiser but were never prepared to put up with the performance, handling and braking compromises they entailed then the XDiavel is perhaps perfect for you. Annoyances were few and far between; but the only one that stood out to me was the irritating indicator switch! It was far too easy to click on the indicators by accident and then a bit hit and miss switching them off. And this isn’t going to be a cheap bike for sure. MCN understands the prices are going to be £15,795 for the standard model and £18,395 for the S model. Both models should be available in March in UK dealers.